The AGP Pellet Stove offers all the benefits of wood heating plus fuel that is clean, compact and easy to use. This freestanding stove is ideal for heating any medium to large living space, giving off a radiant warmth for up to 2,000 square feet. The roaring flames are surrounded by a beautifully arched door that presents a timeless look and will accompany any personal style. The fire viewing area features a super-efficient airwash system to keep the glass clean. With a large, easily removable ashpan and an 80lb. hopper capacity, this stove has the ability to produce extremely long burn times up to 57 hours when burning on a low setting. The AGP freestanding stove is also considered a very clean-burning appliance- producing less than one gram of emissions per hour. The HRD™ rotary feed system prevents over feeding, blockage and burn backs to make for hassle-free operation. Download a PDF of the AGP Pellet Stove brochure. 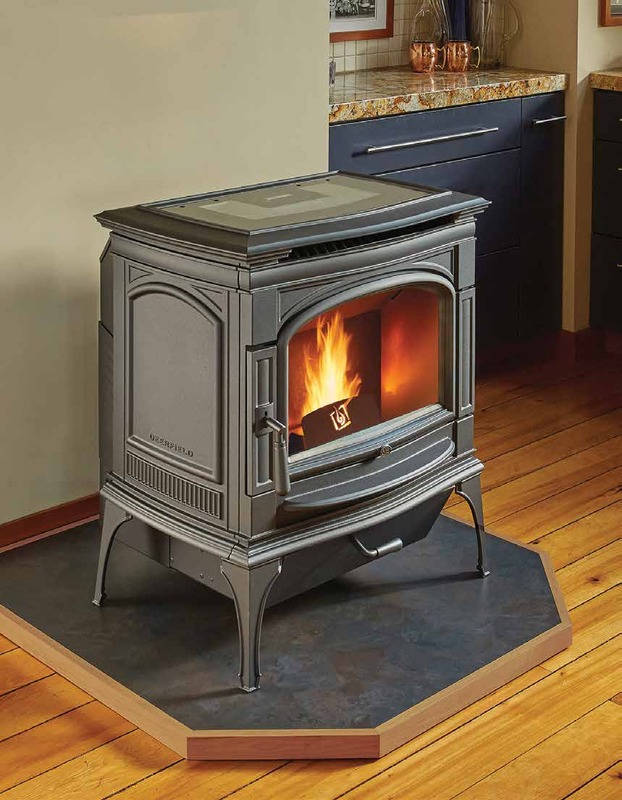 The Deerfield™ combines beautifully proportioned European castings with next generation technology, and optimum performance to bring you a revolutionary pellet stove that is both elegant and easy to live with. Graceful lines, a sleek glass fuel loading door and a large, mirrored ceramic glass viewing area offer a sophisticated look that will complement any home’s décor. Designed to burn all grades of wood pellet fuel, the Deerfield™ features long burn times, up to 35 hours* and efficient heat output that is evenly distributed throughout your home. A 25 pound cast iron heat exchanger produces significantly more heat as compared to traditional designs. BTU Output: 49,200 – 13,940 BTUs/Hr. 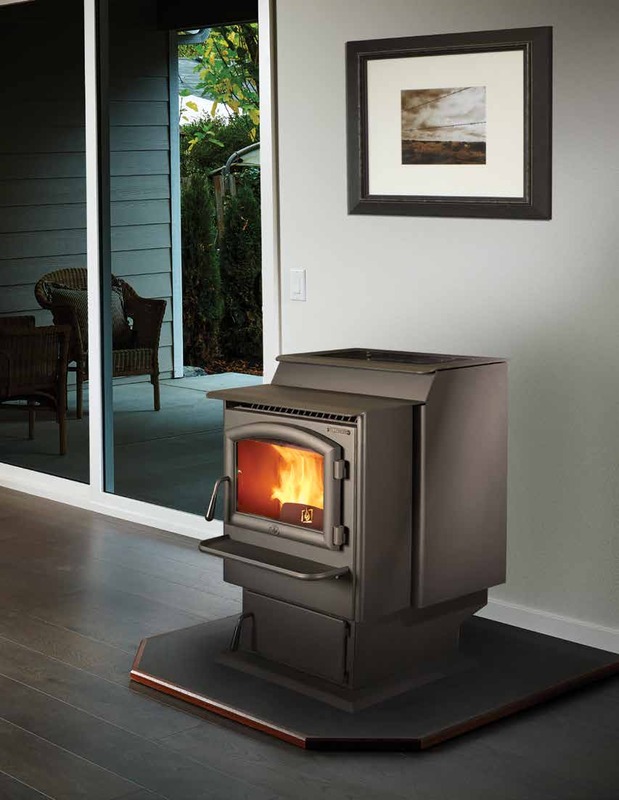 Download a PDF of the Lopi Deerfield Pellet Stove brochure. 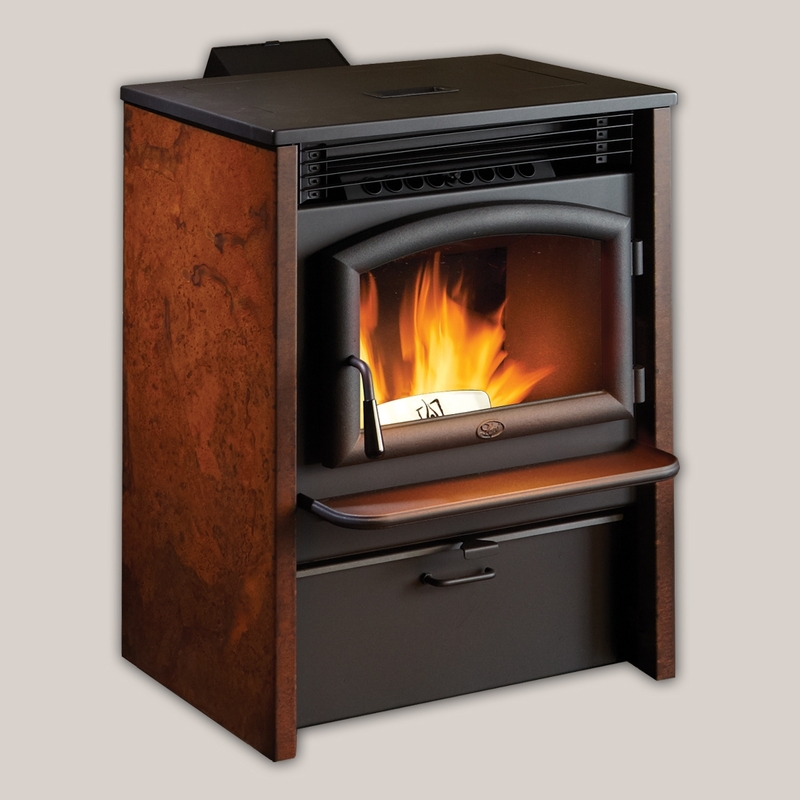 The FoxFire™ offers all the benefits of wood heating plus fuel that is clean, compact and easy to use. The roaring flames are surrounded by a beautifully arched door that presents a timeless look and will complement any personal style. The fire viewing area features a super-efficient airwash system to keep the glass clean. With a large, easily removable ashpan and an 80 lb. hopper capacity, this stove has the ability to produce extremely long burn times up to 47 hours* when burning on a low setting. The FoxFire™ pellet stove’s 25 pound cast iron heat exchanger significantly produces more heat when compared to traditional designs. Download a PDF of the Lopi FoxFire Pellet Stove brochure.